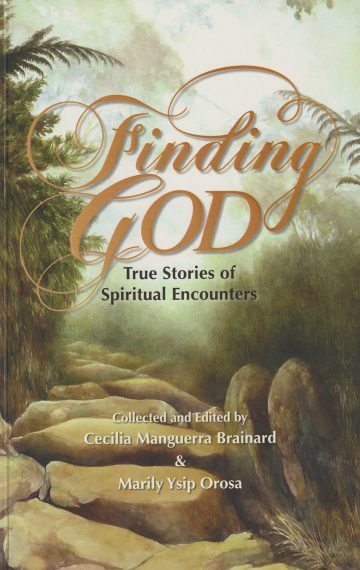 This col­lec­tion of 18 essays focus­es on true-to-life expe­ri­ences of encoun­ter­ing God. Con­trib­u­tors have writ­ten hon­est­ly about their spir­i­tu­al encounter after the death of a fam­i­ly mem­ber, or ill­ness of self or of fam­i­ly mem­bers, or infi­deli­ty of a spouse, or dif­fi­cul­ties with fam­i­ly mem­bers. Oth­ers write of expe­ri­enc­ing God’s pres­ence dur­ing child­birth, in school, dur­ing a zen-moment, and dur­ing pil­grim­ages to Lour­des and Med­ju­gor­je. The expe­ri­ences are var­ied; some writ­ers are Catholics, some are Born-Again Chris­tians. Eleven of the con­trib­u­tors are based in the Unit­ed States, while sev­en are based in the Philip­pines. The book thus pro­vides a Fil­ipino and Fil­ipino Amer­i­can points of view. Con­trib­u­tors are: Mila D. Aguilar, Raquel Villav­i­cen­cio Bal­ag­tas, M.G. Bertul­fo, Susan Evan­ge­lista, M. Eveli­na Galang, Eve­lyn Reg­n­er Seno, Tony Rob­les, Edgar Poma, Aileen Ibardaloza, Pauli­no Lim, Jr., Bri­an Ascalon Roley, Mar­lin­da Angbet­ic Tan, Lisa B. Mar­tinez, Felice Pru­dente Sta. Maria, C. Sophia Ibardaloza, Reme A. Gre­fal­da. Cecil­ia and Mar­i­ly also have essays in the book.